Background: EGFR tyrosine kinase inhibitors (TKIs) are widely used for advanced nonsmall cell lung cancer (NSCLC) patients with a sensitizing EGFR mutation and provide a promising treatment strategy. However, acquired resistance to EGFR-TKIs restricts their application. The mechanisms underlying acquired resistance to TKIs have been explored and Phosphoinositide 3- kinase (PI3K)/Akt/mTOR pathway plays a very important role in NSCLC development as well as EGFR-TKI resistance. Polyphyllin II(PP II) is the main steroidal saponin constituent which derives from the root of Paris polychylia. Objective: We examined the sensitizing effect of PP II to gefitinib on proliferation, apoptosis, PI3K/Akt/mTOR signaling pathway and tumor growth on gefitinib-resistant NSCLC in vitro and in vivo. Methods: Gefitinib-resistant PC-9/ZD cells and gefitinib-sensitive PC-9 cells were used. In the absence of PI3K siRNA, MTT assay, Annexin V/PI analyses, Western blot, and Immunohistochemistry analysis by TUNEL assays for xenograft model were carried out. 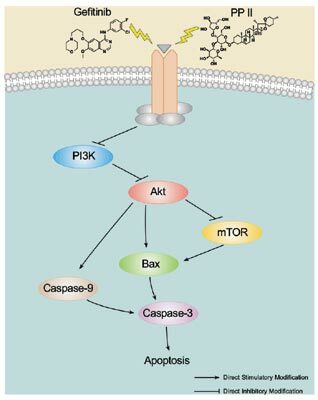 Results: PP II promoted the anti-proliferative effects of gefitinib and gefitinib-induced apoptosis via activation of caspases and cleavage of PARP. PP II elevated sensitization of gefitinib through targeting the PI3K/Akt/mTOR. PP II with gefitinib treatment was more effective in inhibiting tumor growth and PI3K inactivation on gefitinib-resistant xenograft. Conclusion: The results indicated that PP II elevated sensitization of drug-resistant PC-9/ZD cells to gefitinib through the inhibition of PI3K/Akt/mTOR signaling pathway. It provides a potential new strategy to overcome gefitinib resistance for EGFR-TKI resistant NSCLC. Keywords: PI3K, drug-resistance, gefitinib, NSCLC, polyphyllin, apoptosis. Keywords:PI3K, drug-resistance, gefitinib, NSCLC, polyphyllin, apoptosis. Abstract:Background: EGFR tyrosine kinase inhibitors (TKIs) are widely used for advanced nonsmall cell lung cancer (NSCLC) patients with a sensitizing EGFR mutation and provide a promising treatment strategy. However, acquired resistance to EGFR-TKIs restricts their application. The mechanisms underlying acquired resistance to TKIs have been explored and Phosphoinositide 3- kinase (PI3K)/Akt/mTOR pathway plays a very important role in NSCLC development as well as EGFR-TKI resistance. Polyphyllin II(PP II) is the main steroidal saponin constituent which derives from the root of Paris polychylia.